Introducing a less convenient option for hand sanitizing may actually boost workers’ use of hand sanitizer and increase sanitary conditions in the workplace, according to findings in Psychological Science, a journal of the Association for Psychological Science. 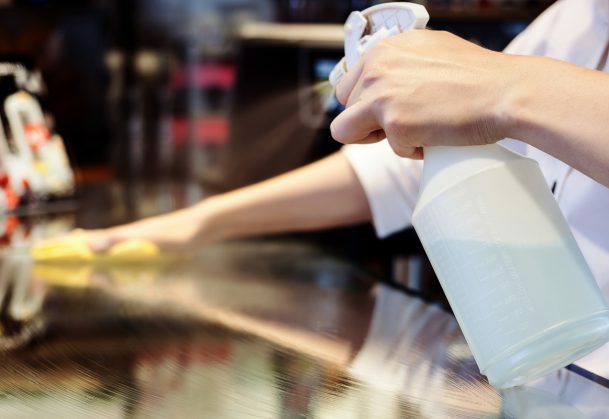 The findings revealed that employees in a food factory used more of their regular sanitizer and had cleaner hands and workspaces after a “decoy” sanitizer option was offered to them. Previous research has provided evidence that the “decoy effect” – when the introduction of an inferior option makes a preexisting option more favorable – can influence individuals’ decision making, at least with regard to hypothetical choices. Li and coauthors Yan Sun and Hui Chen of the Chinese Academy of Sciences wanted to know whether the effect would emerge in a meaningful, real-world setting. The researchers conducted experiments with a combined total of 163 participants in three different Chinese food factories. Li and colleagues observed participants’ hand hygiene behaviors for 20 days without any intervention. Then, they provided employees in the experimental groups — but not the comparison groups — with an inferior hand-sanitizing option and observed participants’ hand hygiene behavior for another 20 days. The employees were routinely supplied with a sanitizer spray bottle as part of their everyday work before the study; although they were supposed to be using it to sanitize their hands and workstations every hour while working with food, factory management reported that compliance with these guidelines was less than optimal. In one factory, the researchers placed a harder-to-use (decoy) squeeze bottle with hand sanitizer right beside the regular spray bottle on each participant’s work table. The squeeze bottle was just as effective as the spray bottle but less convenient to use. In another factory, participants were notified that they could use a wash basin with a soaking solution as another means of sanitizing their hands; the soaking method was very effective but considerably less convenient than the usual spray bottle. In the third factory, the researchers gave employees in the experimental group a harder-to-use squeeze bottle next to the regular spray bottle, just as in the first factory; in this case, the comparison group received a second spray bottle identical to the spray bottle they typically used but in a different color, as a way of controlling for the potential influence of an additional, novel item. Every day, quality control employees measured how much sanitizer the participants used; they also swabbed employees’ hands and work tables, a routine procedure in the factories. Importantly, the appearance of the decoy sanitizer improved cleanliness. During the baseline period, the “pass” rates on the hand swabs were 70-74% among the experimental groups in the three factories; after the decoy sanitizing method was introduced, the pass rates rose to 92-98% in the experimental group, but did not change in the control group. And the data revealed a similar increase in pass rates for the work table swab tests. Li, Sun, and Chen acknowledge that the sample size in each factory was limited, ranging from 40 to 83 participants, but they note that the longitudinal data from each participant provide robust support for a decoy effect. Drawing from these real-world findings, Li plans to conduct similar field experiments in hospital settings. “There are many settings where hand hygiene is a critical issue and the stakes of poor hand hygiene practice are very high, and this research is very relevant in these settings. But more importantly, we should start thinking about the decoy effect as a viable tool to nudge other real-world behaviors” she concludes. This project was partially supported by the National Natural Science Foundation of China (71001098) and the Beijing National Science Foundation (9162017).